Did you know? 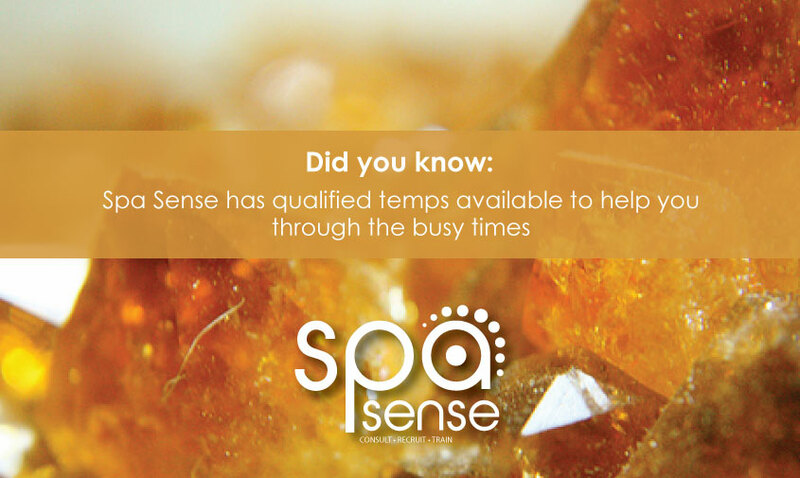 Spa Sense has qualified temps available to help you through the busy times. Are you looking to Staff Up for the busy season but you don’t necessarily need the staff Full time / beyond December? Spa Sense can help you find the perfect temporary staffing solution. Spa Sense can help you find the perfect temporary staffing solution. As you probably know Spa Sense specializes in recruitment specifically for the spa industry. Our niche spa recruitment service includes meeting, interviewing and trade testing each and every candidate before sending them for interviews with our clients. Our aim is to eliminate any tediousness when recruiting staff for your spa, salon or beauty related business. We are firmly rooted in all areas of the industry and have developed close relationships not only with most spas and salons but with the beauty colleges as well. We get directly fed the newly qualified staff who are looking to complete their hours and get lots of industry knowledge as soon as they have completed their studies. They are ready, waiting and ever so eager to start working for YOU! If you are in need of this solution please do not hesitate to contact us on 0116160833 / 25 or follow this link Spa Sense Recruitment and Angela will send you all the necessary information.